Should Pakistan’s Nawaz have been allowed due process instead of being sacked? This piece originally appeared on Dawn on August 16, 2017. Pakistanis, especially drawing room political analysts, love complaining about their dysfunctional democracy and the corrupt, useless politicians that come with it. These politicians, they say, are out only to enrich themselves and their families, and to provide patronage to a larger loyalist biradiri-clan. The politicians buy the poor man’s votes in their constituencies and dupe him into voting for them. The urban, relatively educated, relatively elite home analysts deride the politician as well as the voter that gets bought by him. These analysts think that Pakistan’s flawed democracy deserves its instability. They think Nawaz Sharif had it coming in 2017, just as Benazir and Nawaz did in the 1990s. But they do not stop to consider what effect this instability has on Pakistan’s democracy. We know that ruling parties in Pakistan face uncertain time horizons, and the prospect of almost certainly being booted out of office in the next term, given that two parties have alternated power in each election since 1988. But at the constituency level as well, my research shows that politicians face what is known as an incumbency disadvantage. A technique known as regression discontinuity—essentially comparing a candidate who barely won election to one who barely lost election—allows us to estimate this. 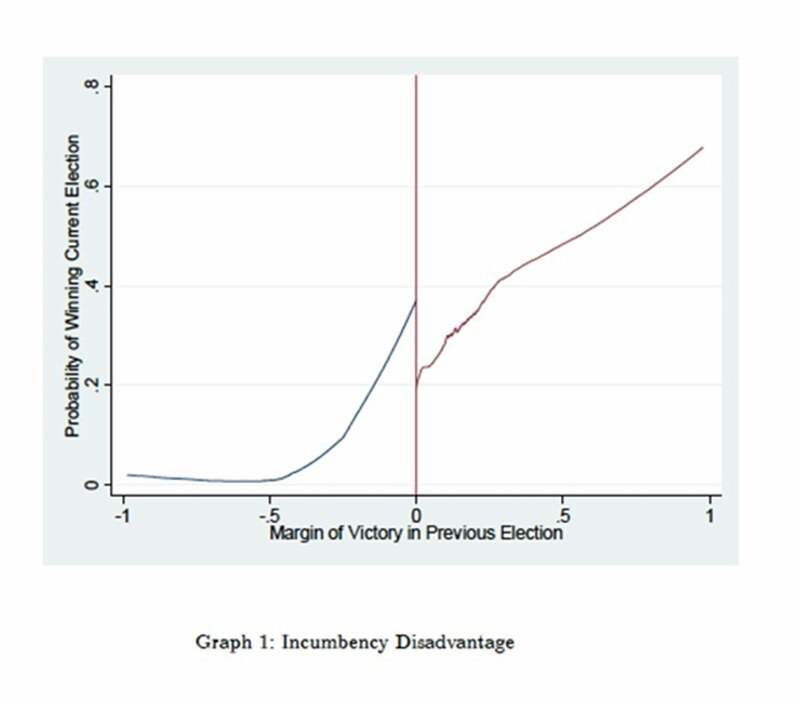 The idea is that politician quality will be similar for both individuals, and the only thing that is different is that one politician became an incumbent and the other did not; looking at both politicians’ likelihood of winning the next election tells us whether there is an incumbency advantage or disadvantage. In Pakistan, between 1988 and 1997, I found that incumbents who barely won the current election were on average between 13 and 16 percent less likely to win the next time than candidates who barely lost this time (see figure below for a graphical representation). This is unusual. In most countries, politicians face an incumbency advantage. Essentially, being in power allows politicians to reveal their competence. That there is an incumbency disadvantage in Pakistan shows that just by virtue of being an incumbent, politicians have revealed something bad about themselves. I also found that only incumbent legislators who belonged to the party in power at the center faced this incumbency disadvantage. This implies that voters punish elected legislators who are part of the majority party—all else equal—perhaps because they consider them complicit in the corrupt activities of the federal government or in other failures associated with it. When politicians face an uncertain time horizon and the prospect of being booted out of office because of the party they belong to, not their own performance—the conditions that exist in the Pakistani context—their behavior will suffer. Two, that it exists only for those politicians elected at the margin who belong to the party in power at the center—thus different sets of politicians and parties in successive elections. Unless those types of politicians systemically behave badly only in the term that their party is in power, which would be strange, bad politician behavior cannot explain incumbency disadvantage. Pakistanis would do well to understand the effects of incumbency disadvantage. They complain rightly about badly behaving politicians, but politicians need stability to behave. The drawing room analysts are thus not free of blame in the saga of Pakistan’s corrupt politicians and its non-delivering democracy. By encouraging instability, they are a player. Let’s be clear. These types of Pakistani analysts have come a long way. They were not voters in previous elections. Yet, they now believe democracy is the best system for Pakistan. It took Musharraf’s disastrous last year to convince them that no good has come of a military government in Pakistan; the belief has sustained after Musharraf, even if some of the enthusiasm for democracy has waned. In June, 2016 after the usual disappointments with Pakistan’s civilian governments had set in, 84 percent of respondents said in a Gallup poll that they preferred democracy to dictatorship. But with the dogged yearlong pursuit of Sharif over the Panama Papers, and his lackadaisical response, the urban, educated Pakistanis have had enough. The frenzy had whipped up to such an extent that they believed that the only fair outcome would be for Sharif to be booted out; anything less than that would be holding up a corrupt regime, and a step back for Pakistan. For these Pakistanis, the signs all pointing in one direction—to corruption—was all the proof needed to disqualify Sharif. The justices felt they had to deliver to these expectations; in the process they delivered a verdict whose basis is so ambiguous that it would disqualify the entire political class of Pakistan if applied thoroughly. And because the basis of this verdict can, realistically, only be selectively applied, it is vulnerable to the charge of subjectivity and scapegoating. You can believe that Sharif is guilty of corruption, and that he lost the right to be prime minister. No matter. The right path would have been to let the accountability court disqualify Sharif on proven corruption in the next few months, or allow the voters the opportunity to boot him out next year. Yet the home analysts cheered the Supreme Court’s verdict; they do not have patience for due process, never having seen it come to fruition. Their impatience is the legacy of the 1990s, and its return tells of a grim future for Pakistan. Because now the cycle can begin again—a weakened incumbent party, able to spin a tale of victimization, has the excuse to not deliver for its constituents. We came close to a better cycle for Pakistan’s democracy this time.